A copy of the written predation testimony submitted on February 10, 2016 can be downloaded here. California resource agencies sink tens of millions of dollars every year into a failing effort to protect native and endangered fish species, while also bolstering introduced top-level predators that are decimating the very fish they are required to maintain. Without question, California’s capital and time investments rival other successful fish recovery programs exemplified in the Pacific Northwest and Columbia River, but long-standing conflicting statutes and policies create fatal flaws that hinder native fish recovery. Decades of research, declining populations, and confused policies show that management of California fisheries is painfully ineffective. Resource agencies have acknowledged, but not addressed the problems. Instead of addressing the issue of predation, policy mandates to maintain nonnative gamefish (i.e. predators) and placate the problem by producing more hatchery salmon have resulted in further deterioration of wild stocks and an alarming reliance on hatcheries. The Central Valley Project Improvement Act (CVPIA) of 1992 actually requires protecting and improving both introduced predatory striped bass and salmonids—an illogical contradiction of science and policy. Fisheries managers have used hatcheries as a band-aid to partially cover a gaping wound. It is acknowledged that supplementing wild salmon populations with hatchery fish is currently necessary to ensure future native fish populations, but hatchery fish are a poor substitute to wild fish. These policies result in both flawed economics and science. For example, increased flow appears to be the popular red herring for recovering native fish populations, but scientific studies continue to indicate that water releases from rim dams are no silver bullet: more water doesn’t equal more fish (or it’s impact on survival is small enough as to be difficult to establish). There is strong evidence that high flows in wet years are beneficial to fish, but recent studies have not been able to establish a relationship between smolt survival and river flow, within the managed flow range. Both the problem and the solution are evident, but the question is whether appropriate action will be enacted. The overwhelming majority of predation on juvenile Chinook salmon is the result of non-native predators that were intentionally stocked by California Department of Fish & Wildlife. Most of the non-native fish species (69%) in California, including major predators, were intentionally stocked by CDFW for recreation and consumption beginning in the 1870s. Numerous studies conducted by both agency and private researchers documented that predation poses a serious threat to juvenile salmon in California. A variety of non-native gamefish species, such as striped bass, largemouth bass, smallmouth bass, white catfish, black crappie, and spotted bass, prey on juvenile salmon in the San Francisco Bay-Delta and its watershed. (Shapovalov 1936, Stevens 1966, Thomas 1967, Pickard et al. 1982, Merz 2003, Gingras 1997, Tucker et al. 1998, Nobriga and Feyrer 2007). However, only recently has the existing body of science on predation been recognized among fisheries managers as a major source of juvenile salmon mortality. “predation on juveniles” one of the most important specific stressors. Further, reducing abundance of striped bass and other non-native predators must be achieved to “prevent extinction or to prevent the species from declining irreversibly” (NMFS 2009). Despite the documented predation of such species on native fishes, high densities of introduced top predators are not being controlled, but in some instances enhanced. For example, changes in federal statutes in the CVPIA required a doubling of natural production of Central Valley populations of anadromous fish within 10 years. 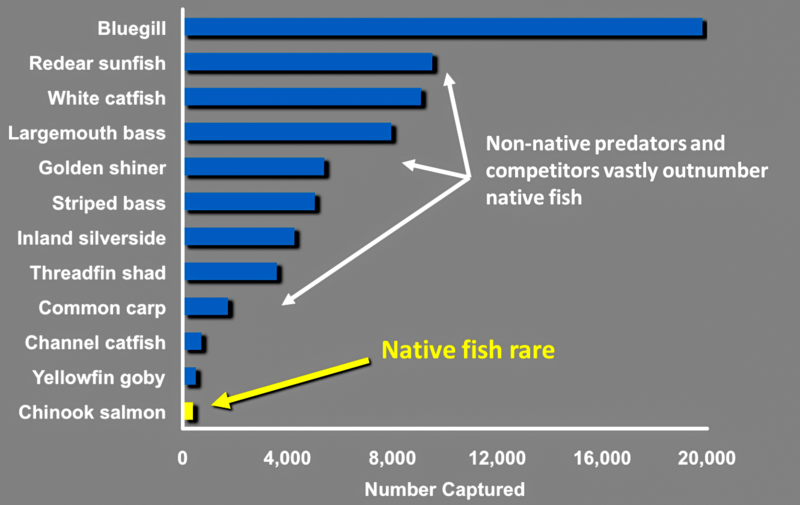 Non-native striped bass were included, thus creating competing goals of doubling both salmon and their introduced predators that were enacted in 1992. Hatchery outplanting of striped bass ended in 1992 (Kohlhorst 1999). 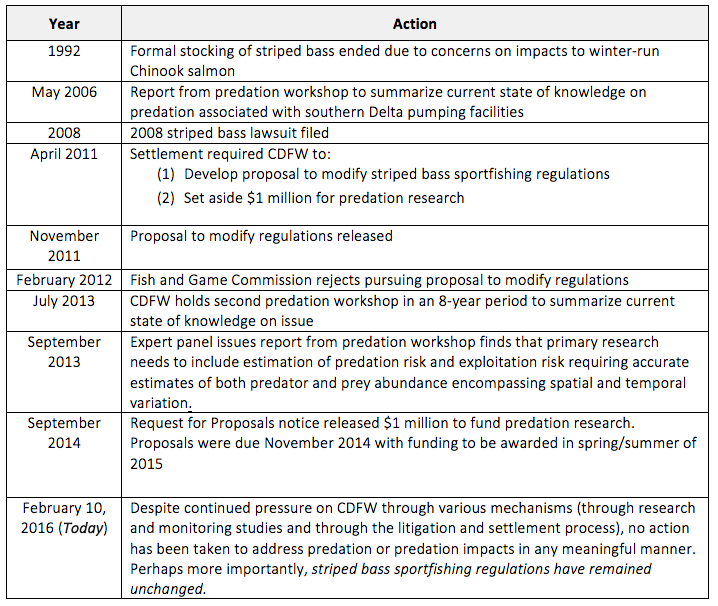 While it is clearly stated that predation is a significant impact on salmonids, it is also evident that policy to date has resisted any effort to challenge the ‘very popular’ striped bass fishery. The issue of predation did not occur overnight and the research to show its effects has progressed over decades. For instance, in the San Joaquin Basin between 1986 and 2006, paired releases of large groups of marked young salmonids (smolts) were made near the upper extent of spawning and near the mouth of several tributaries of the San Joaquin River: the Stanislaus, Tuolumne, and Merced rivers. Survival of fish in these tributaries was estimated based on the numbers of tagged smolts from the upper group relative to the lower group that were later recovered in the San Joaquin River at Mossdale. These mark-recapture studies provided the first direct estimates of very poor tributary survival in some years. Rotary screw trapping to monitor juvenile salmonid outmigration from the Stanislaus River began in 1995, and comparisons of estimated abundance at an upstream site relative to a downstream site near the confluence with the San Joaquin River indicate survival is poor in many years. This data is valuable because it provides estimates of survival for naturally produced juvenile salmon of all lifestages migrating volitionally throughout the varying conditions observed during each migration season. 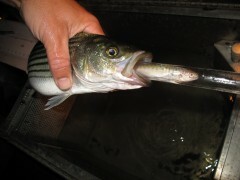 In 1998 and 1999, a pilot study using radio telemetry in the Stanislaus River was the first in the San Joaquin basin to directly confirm predation by electroshocking a large striped bass and retrieving a radio tag (from a tagged, digested salmon smolt) from its stomach. This early research was important for establishing that: predation was occurring; suspected predation was occurring more frequently in substantially altered habitats, such as mine pits and deep scour holes; and non-native predators were present and relatively abundant in the Stanislaus River, even under the wetter hydrology observed in the years studied. The Stanislaus River counting weir, which has been in operation since 2003, was the first of its type used in the Central Valley. Weir monitoring has documented migration characteristics of adult striped bass, and has demonstrated that striped bass live in the river year-round and are abundant, especially in dry years (when salmonids are most stressed). In 2012, after more than 15 years of juvenile outmigrant survival studies and monitoring indicating that predation is a major problem in the Stanislaus River, the USFWS estimated smolt survival in the river using radio telemetry. The survival estimate of 7% in 2012 was much lower than the 40-60% previously estimated by mark-recapture studies conducted by CDFW. Abundance of fish captured in a decade of Delta sampling shows native fish (yellow) are rare. Only eight native species were captured, none of which represented more than 0.5% of the total catch. Data from Feyrer and Healey 2003. Differences in catches between upstream and downstream rotary screw traps in the Tuolumne River between 2007 and 2012 also indicate high losses, ranging from 76% to 98%. In 2012, a study of rotary screw trap monitoring on the Tuolumne River documented 96% mortality of juvenile Chinook outmigrants between these two trapping stations. As part of the FERC relicensing of the Don Pedro Project, a predation study conducted later the same year found that, based on observed predation rates and the estimated predator abundance between the traps, it is plausible that most of the losses of juvenile Chinook salmon between the two traps could be attributed to predation by non-native predatory species. A second year of more comprehensive investigation of predation in the Tuolumne River was planned for 2014 following on the heels of this ground-breaking work completed in 2012; however, permits have not been issued by CDFW. In addition to the evidence in the Stanislaus and Tuolumne rivers, the Vernalis Adaptive Management Plan (VAMP) investigated the relationship between salmon smolt survival through the San Joaquin Delta and flow, exports, and operation of the Head of Old River Barrier between 2000 and 2011. A peer review (Dauble et al. 2010) of this work and the results of similar, earlier studies, concluded that “high and likely highly variable impacts of predation, appear to affect survival rates more than the river flow.” Since 2003, smolt survival through the San Joaquin Delta has consistently been less than 12%, while flows at Vernalis ranged between 2,000 cfs and 27,000 cfs. During spring 2014, a predation study in the lower San Joaquin River near Mossdale was conducted by NOAA Fisheries. Predators were found to outnumber Chinook salmon by a ratio of roughly 200 predators for every 1 Chinook salmon. Similar to recent studies conducted by NOAA Fisheries on the Sacramento River, live Chinook salmon were tethered to quantify the frequency of predation events. On some nights, 100% of the tethered Chinook salmon were preyed upon within one hour, indicating much heavier predation rates in the San Joaquin River than observed during the studies conducted on the Sacramento River. Out of 2,064 deployments of Predation Event Recorders, there were 672 predation events (15-60% per reach). Of the positive identifications of predators (121 had video footage), striped bass were responsible for 99% of the predation (Hayes et al., 2015). Similar to previous work in the tributaries, this study confirmed that low survival rates could be explained by predation by introduced fish species such as striped bass and largemouth bass. This more recent work supports the large amount of evidence that suggested that predation was the primary source of mortality of migrating juvenile salmonids. The best estimates averaged about 30% (range 3 – 99%) from previous studies (Gingras 1997, Hanson 2009, Merz 2003, NMFS 2009). A large body of evidence has been accumulated since the 1990s that all points to the conclusion that predation by non-native predators is having large impacts on sustainability and recovery of native fish species (see previous section). While predation impacts are not the sole reason for declines in native species in California, they remain an important and largely unresolved topic in managing fisheries. Fisheries management in California to this day continues to attempt to manage all fish species in the Central Valley on approximately equal footing – that is, attempting to manage introduced sport fish (i.e., promote striped bass fishing opportunities) while at the same time managing for sensitive and native species (e.g., Chinook salmon, steelhead, and Delta smelt), most of which are federally protected. This highlights the conflicting fisheries management goals of government agencies, which in turn, create and promote conflicts between various stakeholders in the state. In the past decade, the response by the CDFW to the predation issue has largely been the result of litigation and the subsequent settlement agreement (Table 1). Two CDFW workshops were held to address predation, but little action resulted from them, even though decades of research and examples of successful predator control programs were available for review and consideration. The CDFW settlement agreement only resulted in a relatively small funding opportunity ($1 million) to study predation in the Bay-Delta; no changes in sportfishing regulations, and, to date, no meaningful actions of any kind have been taken to accept or address the problem. Simple and straightforward changes to California sportfishing regulations should be implemented to remove harvest limits and size limits on striped bass and other non-native predators. Sportfishing regulation changes could decrease the overall numbers of striped bass and other predators that consume the most salmon per capita. The change would only be one additional tool, among many already required by law (e.g., habitat restoration, water management, etc. ), to aid in the long-term conservation and persistence of native fish species. A change in policy on this issue is not unprecedented. In Fall of 2015, fisheries managers in both Oregon and Washington removed many harvest, season, and size limits for warmwater species (e.g., largemouth and smallmouth bass, walleye, catfish, bluegill, crappie, other sunfish, and northern pikeminnow, among others). The changes in regulations are most drastic on the Columbia River system in order to further support salmonid population recovery. The purpose of the regulation change was to lower the rate at which non-native predators prey on salmon and steelhead smolts, and to simplify complex fishing regulations. More importantly, fisheries managers in both states sent a clear message they are committed to the continued persistence of native fish species. A similar policy change in California, coupled with focused removal and suppression efforts, could lead to improved survival conditions for native species as has been demonstrated on the Columbia River (see section “The Solution”). Table 1. California Department of Fish and Wildlife Predation Response (1990s to Current). The economic contribution of salmon in California is significant. Viewing salmon through the prism of economics allows one to see not only the cultural and iconic value of the fish, but also the tangible and significant economic contribution to California. This is an important consideration in the ongoing discussion about the effects of predation and the many millions of dollars spent each year on monitoring, regulations, research, hatchery supplementation and conservation projects for salmon. Overall, California’s marine recreational and commercial fisheries for all fish species have more economic impact than any other West Coast state, including Alaska (NMFS 2013). The greatest economic impact to California comes from commercial salmon fishing; however, recreational in-river harvest provides the greatest value per fish. The striped bass fishery also provides an economic benefit to the state, but at the cost of high predation to valuable salmonids. The cost for salmon recovery due to striped bass may offset any perceived value. Salmon represent the primary fisheries target species and economic driver. California’s commercial salmon fishery is small compared to other West Coast states, but likely persists as a result of the premium price of local commercially harvested salmon. The 2013 recreational salmon fishery in California produced an overall economic impact of approximately $104.4 million for the state, while the commercial salmon industry produced approximately $244.4 million (NMFS 2013, PFMC 2014, Ransom 2001). In 2010 (most recent available estimate), the California striped bass fishery had an estimated economic impact of $28.7 million (CDFW 2011). The striped bass fishery in California is popular, based on harvest and angler hours. 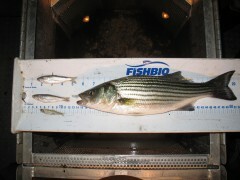 However, the economic impact from striped bass angling is considerably lower than the recreational salmon fishery: a striped bass harvested in-river by a recreational angler provides an estimated economic impact of approximately $494, while an in-river harvested salmon offers an impact of approximately $1,176 (Ransom 2001, CDFW 2001). Increasing striped bass harvest in California could lower predation pressure on juvenile salmonids, increase juvenile survival rates, and significantly reduce costly ongoing salmonid population recovery effort. As the economic value of in-river salmon sport harvest is considerably higher than that of striped bass, there would be a net economic benefit. These estimates of economic impact are conservative compared to other estimates that are available. The American Sportfishing Association (2010) reported that the 2009 closure of the salmon fishery in California cost the state $1.4 billion in economic activity and over 23,000 jobs. The same study estimated that a full recovery of California’s Chinook salmon runs could provide $5.7 billion in economic activity and 94,000 jobs for the state. Considering the staggering economic impact of the salmon fishery, it is logical to assume that hatcheries are an easy solution to the problem of predation. California’s anadromous fish hatcheries produce upwards of 50 million fish per year. In the Central Valley alone, the cost of this production totals nearly $9 million dollars annually (HSRG 2012). However, many would argue that hatcheries are simply treating the symptoms, and not the causes, of salmon decline. It may seem illogical that hatcheries could actually undermine the very species they are meant to proliferate, yet many studies have raised concerns about hatchery practices, backed up by empirical evidence. Multiple fish hatcheries were constructed in California’s Central Valley to mitigate for lost spawning habitat created by dams (Shasta, Folsom, Oroville, Camanche, and New Exchequer) built for both the Central Valley and State Water Projects. Over time, fall run Chinook salmon propagated at the five Central Valley hatcheries have comprised increasing proportions of the fishery, and best available estimates indicate that approximately 90% of the current commercial catch is composed of hatchery fish (Barnett-Johnson et al. 2007, Kormos et al. 2012, Palmer-Zwahlen and Kormos 2013, Palmer-Zwahlen and Kormos 2015). Clearly, without artificial supplementation, there would not be a commercial salmon fishery currently in the state. Hatchery fish are inferior to their wild counterparts for numerous reasons. Overwhelming evidence indicates that hatchery fish have much lower survival rates once released in nature (e.g., Waples 1991, Unwin 1997, Kostow 2004). Unlike wild fish, hatchery fish are selected for traits that allow them to perform well in a captive environment, but are maladaptive in the natural environment. Hatchery fish are raised in predator-free concrete raceways and fed from above by automatic feeders and, consequently, are less able to avoid predators and feed sufficiently once outside of the hatchery. Because of their reduced genetic diversity, hatchery fish are more susceptible to diseases and are less able to adapt to new environmental conditions, such as freshwater flow extremes and warmer ocean temperatures. Indeed, research has demonstrated that hatchery salmonids have relatively small brains and slow sprint swimming speeds, and both factors likely contribute to their relatively low survival rates observed in nature. Salmon are famous for their ability to home back to their birthplaces to reproduce after traveling hundreds to thousands of miles in the freshwater and marine environments. The precise mechanism(s) for salmonid homing are not completely known, but are believed to result from juveniles imprinting on odors during downstream migrations, with subsequent recognition of olfactory cues by adults during pre-spawning upriver migrations (Quinn 2005). Homing promotes adaptations to unique local environmental conditions and increases the likelihood that adult salmon will find mates and adequate spawning conditions. Because of homing, each population has developed local genetic adaptations over time that best fit the unique conditions of their environment. The Central Valley fall-run Chinook stock complex is genetically homogenized (Williamson and May 2005). The lack of any discernable population structure over such a vast geographic area is unique and due, in part, to offsite hatchery release practices (Garza et al. 2008) which have promoted straying. The alarmingly high rates of adult straying is a concern to both conservationists and hatchery managers. Conservationists are concerned that hatchery strays will interbreed with wild fish and reduce the genetic diversity of wild populations. Reduced genetic diversity will make the remaining wild stocks more vulnerable to future environmental change because evolution can proceed only when there is sufficient genetic variation to select from. Hatchery managers are concerned that egg quotas will not be met if too many fish stray away from hatcheries. This occurred during the 2008-2009 salmon fishery collapse for both the Mokelumne and Merced River hatcheries. The increasing reliance on hatcheries to support fisheries is trading short-term gains for long-term losses. The result is market failure, such as that observed during the fishery collapse in California from 2008-2009, when the commercial and recreational salmon fisheries were completely closed and federal and state hatcheries were not able to meet production goals. Substituting hatchery fish for wild fish is a risky long-term strategy for both economic and conservation reasons; heavy reliance on hatchery fish is expensive and requires a constant source of funds to sustain the fishery. Wild salmon populations are self-sustaining and require no such investments from humans as long as the habitat capacity of natural areas is sufficiently productive. Central Valley salmon hatcheries have two main purposes: to sustain commercial fisheries and to reduce pressures on naturally spawning (wild) salmon. With the benefit of 70 years of hindsight, they have arguably failed to achieve both goals. Hatchery reform must include revisions of practices and policies so they are more consistent with restoration objectives. It is the policy of the California Fish and Game Commission that “salmon shall be managed to protect, restore, and maintain the populations and genetic integrity of all identifiable stocks…artificial production shall not be considered appropriate mitigation for loss of wild fish or their habitat” (California Department of Fish and Game Commission, amended 5/9/2008; http://www.fgc.ca.gov/policy/p2fish.aspx). According to USFWS (2009), “the 21st century will demand a shift from managing individual resources to sustaining species, populations, and ecosystems.” Accordingly, the California Hatchery Scientific Review Group (CAHSRG 2012) recommends a cessation of the trucking program because straying must be minimized in order for local adaptations to re-emerge. 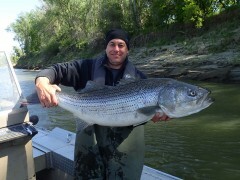 Onsite releases must be favored, but in order to achieve success, alien causes of high in-river mortality rates, such as predation by non-native striped bass, need to be remedied. Predation run amuck is not a new issue and there are examples of successful solutions. One long-running example comes from the Pacific Northwest, a region highly regarded for its advanced fisheries solutions. Northern pikeminnow are indigenous to the Columbia River, but they were not prevalent before the construction of the hydroelectric Federal Columbia River Power System. Reservoirs created by the hydropower system provided excellent slack water habitat for pikeminnow, and as a result their population in the lower Columbia and Snake Rivers flourished. Northern pikeminnow are voracious predators and salmon smolts comprise a large portion of their diet (Sauter et al 2004). These native predators now consume millions of salmon and steelhead each year in the lower Columbia and Snake River systems. The Northern Pikeminnow Management Program (NPMP) was established in 1990 in an effort to reduce predation by northern pikeminnow on juvenile salmon and steelhead as they emigrate from the lower Columbia and Snake Rivers to the ocean. The goal of the program is not to eliminate northern pikeminnow, but to reduce their average size and decrease the number of larger, older fish that are known to be highly predacious. Since 1990, the Bonneville Power Administration (BPA) has sponsored the Northern Pikeminnow Sport Reward Fishery Program in the lower Columbia River and a portion of the Snake River (from the mouth to Hells Canyon), offering cash to registered anglers for each northern pikeminnow they catch measuring nine inches or longer. Site-specific gill netting and dam angling were also part of the NPMP, but were less efficient than the sport reward program and were discontinued in 2002 and 2006, respectively. Since 1990, the BPA has paid anglers to remove more than 3.9 million northern pikeminnow from the Columbia and Snake Rivers (annual average of 175,000), reducing predation on juvenile salmon by an estimated 40 percent. The successful predator removal program equated to saving 4 to 6 million salmon smolts that would have otherwise been eaten. Not only did the program save salmon, it was extremely cost-effective. Of the program’s $2.9 million budget, it is estimated that $1.4 million was returned to local economies from angling activity. Further, researchers estimated that the increased salmon resulted in $2.7-$9.9 million dollar benefit for economies from California to Alaska. While the public or outward perception of CDFW may appear as though the agency is actively addressing the predation issues through publically visual workshops, the agency has privately thwarted efforts by private interests (i.e., water rights holders) to study the predation problem on their affected rivers and streams, and to collaboratively work with all stakeholders towards a solution. One such study was proposed in 2013, when FISHBIO, on behalf of water users, proposed to test whether reducing the number of non-native predators increases survival of juvenile Chinook salmon migrating through the lower Stanislaus River. To address this hypothesis, the overall goals of the Stanislaus River Predator Suppression Project were to 1) substantially reduce the abundance of non-native predators in the lower river by both preventing immigration of non-native predators into the river and removing existing non-native predators; and 2) to evaluate survival patterns of juvenile Chinook salmon during the same period. Other proposed predation studies in California, which were supported by federal agencies and also fully funded by water rights holders, have been delayed, blocked, or otherwise not allowed due to ‘permitting issues,’ often with little scientific or technical justification. While there is no guarantee that active predator management (i.e., predator suppression or removal projects) in California’s Central Valley will substantially improve conditions for native species, it is guaranteed that continuing with the status quo will hinder or completely prevent species recovery and sustainability of native species. The effects of predation are undoubtedly an important driver in population dynamics of native fish populations in the Central Valley, and the hesitation to enact meaningful regulations and actively study the issue is troublesome. In addition, the lack of focus on such an important topic does not represent a comprehensive management strategy to manage a unique suite of native fish species in California. Innovative solutions to species recovery using a variety of tools (e.g., habitat restoration, targeted or passive predator management) should be implemented without delay to promote the survival and sustainability of California’s iconic native species. My name is Doug Demko. It is my pleasure to share this information and my experience with you. I am the President of FISHBIO (www.fishbio.com), a fisheries consulting firm with over 40 U.S. and international employees that specializes in fisheries research, monitoring, and conservation. I have been researching freshwater and anadromous fish in California for 25 years, including studying the potential impacts of dam and hydropower operations on fish populations. I have led research and monitoring efforts on the Stanislaus River since 1991, and currently work on the Calaveras, Stanislaus, Tuolumne, Merced, and San Joaquin rivers for a number of stakeholders. I have had the privilege of providing expert testimony on the impacts of flow on juvenile Chinook salmon and steelhead migration and survival in the San Joaquin River Basin to the State Water Resources Control Board on several occasions. I also prepared a brief on California Delta Chinook salmon predation losses for U.S. Senator Dianne Feinstein prior to a Congressional Meeting with House Speaker Pelosi and Senator Boxer on Central Valley fish and water issues, and twice provided expert testimony on the extent and causes of losses of juvenile Chinook salmon and steelhead in California’s Central Valley tributaries and Delta to California State Legislature Congressional subcommittees. In addition to my work in the U.S., I also direct FISHBIO’s international research, including our office and staff in Lao People’s Democratic Republic, where we work extensively in the Mekong Basin. Our research includes evaluating fishery and food security issues relating to hydropower development. FISHBIO has received grants from the U.S. State Department, U.S. Geological Survey (USGS), World Wide Fund for Nature (WWF), International Union for the Conservation of Nature (IUCN), Critical Ecosystem Partnership Fund, Wildlife Conservation Society (WCS), The Asia Foundation, and others. I am privileged to work for and partner with many leaders in global conservation efforts. Bowen, MD, Hiebert, S, Hueth, C, & Maisonneuve, V. 2009. Effectiveness of a Non-Physical Fish Barrier at the Divergence of the Old and San Joaquin Rivers (CA). U.S. Department of Interior/Bureau of Reclamation Technical Memorandum 86-68290-09-05. 24 pp. CDFG [California Department of Fish and Game]. 2011. Report and Recommendation to the Fish and Game Commission in Support of a Proposal to Revise Sportfishing Regulations for Striped Bass. December 2011. CDFG [California Department of Fish and Game]. 2001. California’s Living Marine Resources: A Status Report. California Department of Fish and Game, Sacramento, California. CDFW [California Department of Fish and Wildlife]. 2010. F-119-R Central Valley Angler Survey, 2009-2010. California Department of Fish and Wildlife, Sacramento, California. Dauble, D, Hankin, D, Pizzimenti, J, & Smith, P. 2010. The Vernalis adaptive management program (VAMP): report of the 2010 review panel. Delta Science Program, May, 13. FISHBIO. 2013. Predation study report. Don Pedro Project FERC NO. 2299. Gingras, M. 1997. Mark/Recapture Experiments at Clifton Court Forebay to Estimate Pre-Screening Loss to Juvenile Fishes: 1976-1993. Department of Fish and Game, prepared for Interagency Ecological Program, 22 p.
Hanson, CH. 2009. Striped bass predation on listed fish within the Bay-Delta estuary and tributary rivers, submitted as an expert report in Coalition for a Sustainable Delta et al. v. McCamman; (Case No. CV 08-397-OWW). Hayes, SA, et al. 2015. “Development and Use of Passive, Baited, GPS-enabled Predation Event Recorders to Measure Juvenile Chinook Salmon Predation in a River Environment”. Presenation at IEP Conference, Folsom, CA. March 18-20, 2015. Hendry, AP, & Stearns, SC. 2004. Evolution Illuminated. Oxford University Press. [JHRC] Joint Hatchery Review Committee. 2001. Final report on anadromous salmonid fish hatcheries in California. Sacramento (CA): California Department of Fish and Game and National Marine Fisheries Service Southwest Region. Kohlhorst, DW. 1999. Status of striped bass in the Sacramento-San Joaquin Estuary. California Fish and Game 85(1):31-36. Kostow, KE. 2004. Differences in juvenile phenotypes and survival between hatchery stocks and a natural population provide evidence for modified selection due to captive breeding. Canadian Journal of Fisheries and Aquatic Sciences 61:577-589. MacFarlane, RB, S Ralston, C Royer, & EC Norton. 2005. Juvenile chinook salmon (Oncorhynchus tshawytscha) growth on the central California coast during the 1998 El Niño and 1999 La Niña. Fisheries Oceanography 14:321-332. Merz JE. Striped bass predation on juvenile salmonids at the Woodbridge Dam afterbay, Mokelumne River, California. 2003. Unpublished draft document. East Bay Municipal Utility District, 4. Michel, CJ. 2010. River and estuarine survival and migration of yearling Sacramento River Chinook salmon (Oncorhynchus tshawytscha) smolts and the influence of environment (Master’s of Arts, University of California, Santa Cruz). Newman, KB, & Brandes, PL. 2010. Hierarchical modeling of juvenile Chinook salmon survival as a function of Sacramento–San Joaquin Delta water exports. North American Journal of Fisheries Management, 30(1), 157-169. National Marine Fisheries Service. 2009. Public Draft Recovery Plan for the Evolutionarily Significant Units of Sacramento River Winter-run Chinook Salmon and Central Valley Spring-Run Chinook Salmon and the Distinct Population Segment of Central Valley Steelhead. Nobriga, ML, & Feyrer, F. 2007. Shallow-water piscivore-prey dynamics in California’s Sacramento–San Joaquin Delta. San Francisco Estuary and Watershed Science, 5(2). Palmer-Zwahlen M, & Kormos B. 2015. Recovery of coded-wire tags from Chinook salmon in California’s Central Valley escapement and ocean harvest in 2012. Fisheries Branch administrative report no. 2015-4. Perry, RW, & Skalski, JR. 2008. Migration and survival of juvenile Chinook salmon through the Sacramento-San Joaquin River Delta during the winter of 2006-2007. Report prepared for the US Fish and Wildlife Service. Perry, RW, & Skalski, JR. 2009. Survival and migration route probabilities of juvenile chinook salmon in the Sacramento-San Joaquin River Delta during the winter of 2007-2008. School of Aquatic and Fishery Sciences, University of Washington. Pickard, A, Grover, A, & Hall Jr, FA. 1982. An evaluation of predator composition at three locations on the Sacramento River. Interagency Ecology Study Program for the Sacramento-San Joaquin Estuary Technical Report, (2), 9-15. PFMC [Pacific Fishery Management Council]. 2014. Review of 2013 Ocean Salmon Fisheries: Stock Assessment and Fishery Evaluation Document for the Pacific Coast Salmon Fishery Management Plan. Pacific Fishery Management Council, Portland, Oregon. Quinn, TP. 2005. The behavior and ecology of Pacific salmon and trout. University of Washington Press. Ransom, MM. 2001. Economic Impacts of Salmon Fishing. Natural Resource Conservation Service, United States Department of Agriculture. Davis, California. Sauter, ST, McMillan, J. & Dunham, JB. 2001. Salmonid behavior and water temperature. Environmental Protection Agency, Issue Paper 1, 38 p.
San Joaquin River Group. 2013. Salmon smolt survival investigations. Ch. 5 in 2011 Annual Technical Report on implementation and monitoring of the San Joaquin River Agreement and the Vernalis Adaptive Management Plan (VAMP), Prepared for California Water Resources Control Board in compliance with D-1641, 52 pp. Sholes WH, & Hallock RJ. 1979. An evaluation of rearing fall-run Chinook salmon, Oncorhynchus tshawytscha, to yearlings at Feather River Hatchery, with a comparison of returns from hatchery and downstream releases. Calif Fish Game 65:239–255. Stevens, DL. 1966. Food habits of striped bass (Roccus saxatilis) in the Sacramento-San Joaquin Delta. Pages 68-96 in J.L. Turner and D.W. Kelley, eds. Ecological studies of the Sacramento-San Joaquin Estuary, part II: fishes of the Delta. California Department of Fish and Game. Bull.136. Thomas, JL. 1967. The diet of juvenile and adult striped bass, Roccus saxatilis, in the Sacramento-San Joaquin river system. California Department of Fish and Game 53(1):49-62. Tucker, ME, CM. Williams & Johnson, RR. 1998. Abundance, food habits and life history aspects of Sacramento squawfish and striped bass at the Red Bluff Diversion Complex, including the Research Pumping Plant, Sacramento River, California, 1994-1996. Red Bluff Research Pumping Plant Report Series, Volume 4. U.S. Fish and Wildlife Service, Red Bluff, California. Unwin, MJ. 1997. Fry-to-adult survival of natural and hatchery-reared chinook salmon (Oncorhynchus tshawytscha) from a common origin. Canadian Journal of Fisheries and Aquatic Sciences 54:1246-1254. Vogel, D. 2010. Evaluation of acoustic-tagged juvenile Chinook salmon movements in the Sacramento- San Joaquin Delta during the 2009 Vernalis Adaptive Management Program. Natural Resource Scientists, Inc. Red Bluff, CA. Vogel, D. 2011. Evaluation of Acoustic-Tagged Juvenile Chinook Salmon and Predatory Fish Movements in the Sacramento – San Joaquin Delta during the 2010 Vernalis Adaptive Management Program. Natural Resource Scientists, Inc. Red Bluff, CA. Waples, RS. 1991. Genetic interactions between hatchery and wild salmonids: lessons from the Pacific Northwest. Canadian Journal of Fisheries and Aquatic Sciences 48 (Supplement 1):124-133. Williamson KS, & May B. 2005. Homogenization of fall-run Chinook salmon gene pools in the Central Valley of California, USA. N Am J Fish Manag 25:993–1009.